One would have to be living under a rock to not know about Windows 8. Everyone who does know about it though will agree that Windows 8 is different. Reimagined boldly, to use the words Microsoft themselves have used. But with this reimagination comes change – quite a lot of them. The biggest change is no doubt the Windows Start screen, basically the home of the Modern UI and in fact, the OS. Windows focused so much on this aspect of the new OS that a lot of people kind of got the wrong idea and thought that the traditional desktop was gone for good. Entirely untrue. The traditional desktop is still there, and if you like you can spend all your time with Windows 8 there – just like you did in the previous operating system. To simply put in a nutshell – the desktop is what you’ve been using all this time as mentioned above where you’ll be able to use all the old softwares, applications and games you’ve been familiar with your whole life. And the Modern UI has apps that run in that modern interface which will be uniform across desktops, notebooks and tablets in the same way. For example – Netflix didn’t have an app that ran in the Modern environment until the day of official release for Windows 8 – so you would have had to use the netflix website till then. There’s a desktop app for spotify but not for Modern. And so on. So, you installed an app but can’t find it? Nope, that’s for the old days. The search feature for Windows 8 is something else entirely. You’re in the Start Screen – you need to run an app and it’s not pinned? Just start typing. Everything is indexed and the search feature is blazing fast. To try it out while writing this – I typed in F.
It instantly brought up the results – 10 apps with F in it, 213 settings options, and 1437 files. Finding and running apps or files has never been easier. But here are some simpler navigation controls. There is of course hovering your mouse to the right corner to bring up the charms menu which usually has app settings and where you can access PC settings, volume, power and so on forth. 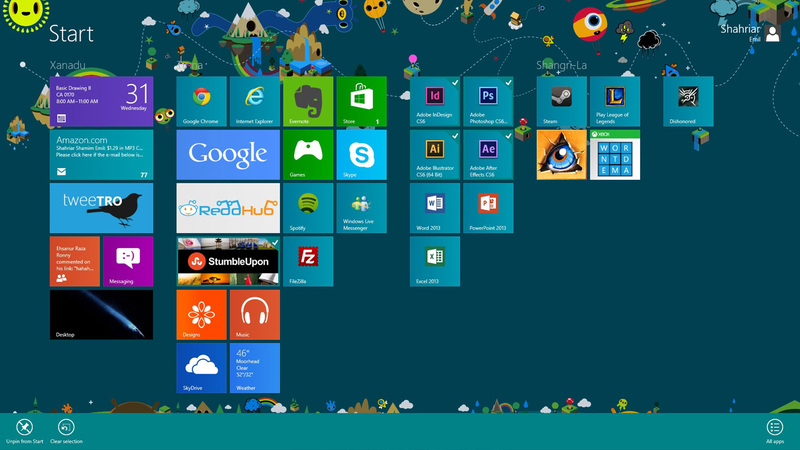 Need to pin/unpin apps from the Start screen or taskbar, or delete the tile altogether? Right click on any tile, to bring up the context menu – Aside from pinning/unpinning and deleting, you can also make the tile bigger, open its file location or run as administrator. You can also select multiple files by right clicking on multiple tiles – this lets you unpin multiple tiles at a go. And if you just want to look through all the files in your ‘start menu’ manually instead of searching for designed apps – you can access that in two ways. The first is by clicking anywhere on the screen, even a tile – this brings up the context bar. On the bottom right will be a button labeled “All apps”. Accessing that gives you the list of metro apps installed as well as anything on your start menu. Closing a Modern app is amazingly simple. Simply drag the app from the top edge to the bottom edge and you’re done. Alternatively, hovering your mouse on the top left corner brings up all the Modern apps currently open. From there you can right click to either close it or dock it to the left or right of the screen or not. And the last two tips of the day – Windows + C brings up the Charms bar on the right which lets you access settings, both app specific as well as Windows. You can also access the Start Screen, Search, Share and see your Devices. Most applications will have their settings here. You can also turn off your computer from here by clicking on the Settings button, and then Power at the bottom. On the other hand, you can bypass the Charms bar by directly pressing Windows + I to bring up the Settings menu. And of course, if you’re on your desktop environment, you can press Alt + F4 to bring up the shutdown menu. The new operating system is truly awesome and makes a lot of things very efficient! So, get yourself a little familiarized with these shortcuts and features and stay tuned for some more tips and tricks for using Windows 8 and upping your productivity. I am kind of disappointed with the interface in Win 8. Its interface suits perfect for touch screen device not for laptops or desktop. Hmm. Can you tell me where you have the issue with? What particular aspect of the interface bothers you? Thank you for your quick response, Emil. I don’t the like new interface of Win 8 desktop. Is there a way to make it like Win 7 or tradition one? Err, not sure why you would want to. But you can’t anyway. I would suggest getting yourself familiarized with the interface. It’s definitely NOT limited to just touchscreens, though. I’m on a keyboard + mouse and feel no hindrance from a technical point of view.